Esri president Jack Dangermond explaining the conference theme, The Science of Where. In July, 18,000 people from the United States, Canada, the United Arab Emirates, Germany, Ecuador, and dozens of other countries got together for the world’s biggest GIS meeting in San Diego, California. For the 38th year, users of Esri technology have met face-to-face to learn, make friends, and have a little fun at the Esri User Conference. During the Plenary Session, Esri president Jack Dangermond called attendees special people “because you hold inside of you the grains of a better future. You are the people who will come up with the solutions to the challenges we are facing as individuals and as organizations.” Dangermond showed examples of the work of scores of users who are addressing challenges such as population increase, climate change, loss of nature, and social conflict. In his explanation of the conference theme—The Science of Where—Dangermond provided some historical context. From the beginning, GIS was applied to science, but it was not until 1993 when Dr. Michael Goodchild characterized geographic information science (GIScience) as an area of intellectual activity that addressed the fundamental issues raised by GIS that the world began to realize GIS is a science in its own right. 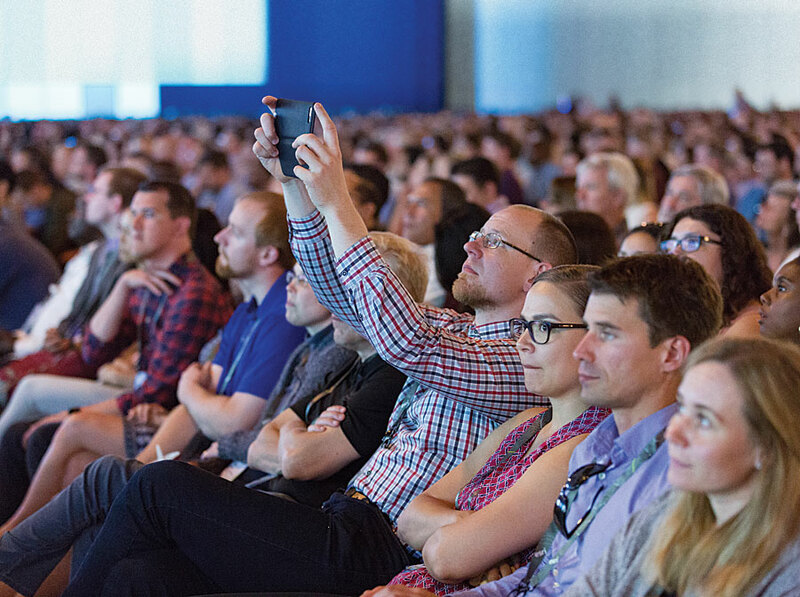 The 2017 Esri User Conference had the largest attendance in the event’s history. GIScience incorporates geography, data science, modeling, analytics, visualization, computer science, decision support science, and many others and integrates these into a kind of metascience. What is The Science of Where? 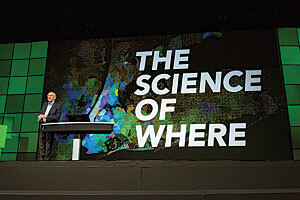 “Simply stated, it is the science of geography and the technology of GIS,” said Dangermond. It is a framework for applying science to almost everything that lets us look at relationships and look at things as a whole so we can better solve problems and meet challenges. Using the power of where to integrate all kinds of data to foster better understanding and collaboration, it produces a system of insights. The development of GIS technology has greatly enhanced the application of The Science of Where by taking advantage of new kinds of computing as well as faster computers. GIS now uses technologies such as augmented reality, statistical modeling, and crowdsourcing. Web GIS, the modern GIS pattern, is leveraging web services to integrate organizations with shared knowledge. Now, working with all types of data is greatly simplified. Real-time information is making maps alive. Apps are bringing GIS to everyone on mobile devices and dashboards. Story maps are being created by thousands of people who are using GIS to tell their stories. The 3D capabilities in ArcGIS Pro and across the ArcGIS platform are integrating GIS into planning and design processes. GIS is creating value from the wiring up of the world into the fabric of the Internet of Things (IoT). It is helping cities become smart communities that benefit from this massive digital transformation. 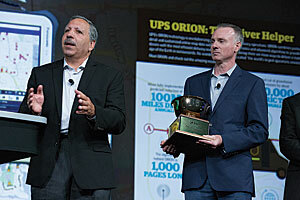 UPS, winner of the President’s Award, realizes annual savings of $350 million through its On-Road Integrated Optimization and Navigation (ORION) system. Abu Dhabi, the federal capital of the United Arab Emirates, exemplifies this progressive development and was recognized with the inaugural Digital Transformation in GIS Award. In presenting the award, Dangermond noted that Abu Dhabi took GIS “to a new frontier and pushed the limits” by integrating GIS into every government operation and making it accessible to every employee, so it deserved major acknowledgment for this achievement. Another organization was honored for making geospatial information accessible. The National Geospatial-Intelligence Agency (NGA) received the Enterprise GIS Award. Not only does the NGA have the largest GIS database in the world, but it also maps the entire world and has implemented a portal that provides geospatial intelligence (GEOINT) services to thousands of users. The winner of another award demonstrated how GIS can now be taken to scale. UPS was the winner of the President’s Award. It has realized annual savings of $350 million through its On-Road Integrated Optimization and Navigation (ORION) system, which optimizes delivery routes for the 19 million packages UPS delivers every day.